Knee pain is one of the common complaints that people seek consultation for. Knee pain can be acute or chronic. Acute knee pains can be caused by an acute injury or infection. Chronic knee pains could follow an episode of acute pain but also could start insidiously and progress with time. Repetitive injuries, inflammatory diseases, and chronic infection could lead to chronic knee pain. Chronic pain generally results from a long-standing medical condition or damage to the body. The knee joint is formed by the femur bone above and tibia below. Patella is a sesamoid bone that is present in the tendon of quadriceps on the anterior aspect of the knee and forms patellofemoral part of the knee joint. The main joint is between the tibia and femur. The fibula is not directly involved in the knee joint but is close to the outer portion of the joint. The knee is more than just a simple hinge joint. It also twists and rotates. A number of structures support and stabilize the knee which includes bones, ligaments, tendons, and cartilage. Ligaments are fibrous bands that connect bones to each other. 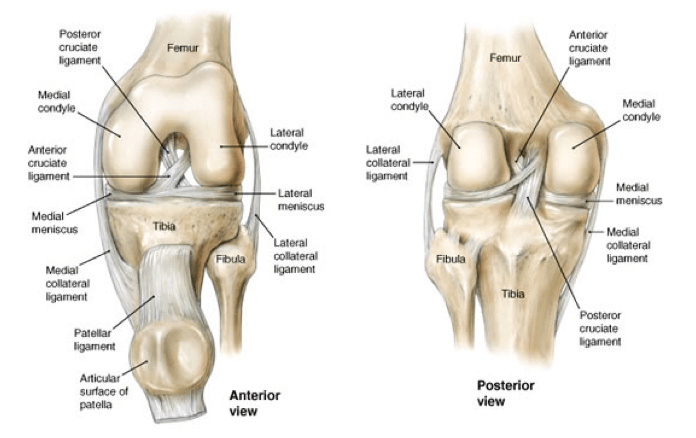 Four important ligaments of the knee joint are – the anterior cruciate ligament, posterior cruciate ligament, medial collateral ligament and lateral collateral ligament. Tendons are glistening fibrous bands between connecting muscles to the bones. Quadriceps is the large muscle in front of thigh and tendon of quadriceps is connected to the tibial tuberosity. In between, a sesamoid bone called patella is present and adds leverage to quadriceps function. Patella also acts as stabilizer anteriorly. The part of the tendon between the patella and tibial tuberosity is called patellar tendon. Commonly, the term quadriceps tendon denotes the part connecting to the patella. Menisci are cartilaginous structures that cushion the knee joint. Two menisci, lateral and medial are present. They provide both space and cushion for the knee joint. Bursae are fluid-filled sacs that help to cushion the knee. The knee contains three important groups of bursae. The prepatellar bursa lies in front of the patella. The anserine bursa is located on the inner side of the knee about 2 inches below the joint. Injuries can lead to fracture of the knee bones. For a fracture to occur substantial force is required to break the bone. Fractures lead to severe pain acutely and are often accompanied by significant soft tissue injury. The patient typically is not able to bear weight after the injury when a fracture is there. An injury is an emergency and should be accordingly dealt. Fractures around the knee could be associated with vascular and/or neural injuries. Dislocation of knee and dislocation of the patella are common types of dislocations. Dislocation of the knee occurs with a severe trauma and maybe limb-threatening because of vascular injury being commonly associated. The dislocation of the knee causes severe ligament, artery and nerve injury. Knee dislocations are very painful and lead to grotesque deformity of the knee. Dislocations require urgent reduction. Sometimes, the reduction may occur spontaneously. Dislocation of the patella is caused by direct trauma or forceful straightening of the leg. Patellar dislocation is more common in women, the obese, knock-kneed people, and in those with high-patella. Ligament injury can occur with twisting forces. Ligaments could injure without injury being caused to bony structures. The medial collateral ligament is the most commonly injured ligament in the knee. The severity of ligament injury may vary from partial to complete. Anterior cruciate ligament injury is a common sports injury generally due to twisting of the knee. Posterior cruciate ligament is stronger and less commonly torn. Both ligaments are crucial for knee stability and knee instability results when an injury occurs to cruciate ligaments. Ligament injuries are common in contact sports. Tendon rupture could also occur following multiple steroid injections in the tendon. Following rupture, there is anterior knee pain especially on the extension of the knee. A patient with complete rupture would not be able to extend the knee though pain could lessen after some time. Tendon ruptures generally require surgical repair. Injuries to menisci can lead to knee pain, especially on movement and weight bearing. Meniscal tears may cause the knee to lock, produce clicking and grounding sound during movement of the knee. Meniscal injuries in young require surgical repair, often arthroscopically. A recent study has indicated that exercise therapy is as effective as arthroscopy in case of a degenerative tear. A positive McMurray test may indicate a meniscal tear. Osteoarthritis is degenerative arthritis caused by age-related changes in the knee cartilage. Obesity, trauma, and infection of the joint may accentuate the degeneration of the knee cartilage. Osteoarthritis is a slowly progressive disease and causes a chronic knee pain which worsens with activity. The patient also complains of stiffness after prolonged sitting. Eventually, knee deformity may occur. Rheumatoid arthritis is inflammatory arthritis which affects multiple joints and knee is commonly included. There is also associated morning stiffness and pain in other joints. Apart from this knee could be involved in psoriatic arthritis, ankylosing spondylitis, and other spondyloarthropathies. This includes gout and pseudogout . The pain is usually rapid in onset and the knee is markedly inflamed knee joint. Bursitis is inflammation of naturally occurring bursae in the body. These occur due to acute or chronic trauma or infection. Common bursitis around the knee are prepatellar bursitis, infrapatellar bursitis, and anserine bursitis. Description: As a result of trauma, infection, or crystalline deposits, the various bursae of the knee may become inflamed. Bursitis is well treated with rest and drug treatment. Knee infectious arthritis could be due to bacteria, mycobacteriae or fungal agents. Bacterial arthritis has an acute presentation. Tubercular and fungal arthritis have a subacute or chronic presentation. Treatment included antibiotics and drainage of pus wherever required. In patellofemoral syndrome, the patella rubs against the inner or outer femur rather than tracking straight down the middle. As a result, the patellofemoral joint on either the inner or outer side may become inflamed, causing pain that is worse with activity or prolonged sitting. Progression of the disease leads to softening and decay of the articular cartilage on the undersurface of the patella and is called chondromalacia patella. This is more commonly seen in sportspersons. It is characterized by anterior pain that worsens when a person changes position from sitting to standing or when walking or running uphill. There is tenderness at patellar tendon insertion into the lower pole of the patella. There is a pain on the lateral aspect of knee and tenderness in posterolateral joint line. It is more likely to occur in downhill runners. Webb’s maneuver involves making the patient supine, the knee is flexed to 90°, and the leg is internally rotated. The patient is asked to rotate the knee externally and the examiner resists it. The attempted external rotation elicits pain. Running downhill is considered as a risk factor. It is the most common overuse syndrome of the knee and results in lateral knee pain. Cyclists, dancers, long-distance runners, football players, and military recruits are at risk. The iliotibial band is a fibrous band that extends from ilium and tensor fasciae late to the proximal tibia. A tightness of this band may lead to rubbing against the lateral femoral epicondyle and pain on the outer aspect of the knee. This condition commonly affects distance runners and pain begins after completion of a run or several minutes into a run. Pain is aggravated by running down hills, lengthening stride, or sitting for long periods of time with the knee flexed. In Ober test, the patient lies down with the unaffected side down and unaffected hip and knee at a 90° angle. With the tight iliotibial band, the patient will have difficulty adducting the leg beyond midline and may experience pain at the lateral aspect of the knee. Osgood Schlatter Disease is an osteochondrosis of tibial tuberosity and is found in adolescents especially those who participate in sports. The pain is typically reported at the tibial tuberosity where patella tendon inserts. The pain is worse when extending the leg. On examination, the tuberosity would be tender to touch. It is a self-limited condition that usually resolves as the bone stops growing with the end of adolescence. Treatment includes rest and NSAIDs. The diagnosis of knee pain is based on the presentation of a patient and examination findings. Lab investigations as required are done. Lab investigations are important to diagnose infection, inflammatory arthritis etc. The lab work includes complete blood count, ESR estimation, CRP, rheumatoid factor and other parameters as needed. Fluid from the knee may be aspirated and subjected to Gram staining and culture to look for an infective agent, crystals or biochemical analysis. X-rays can help to detect bony injuries and arthritic changes. CT scan can identify various bone lesions in greater detail. MRI is helpful in the identification of lesions of soft tissue such as ligament injuries, tendon injuries, cartilage injuries, and other soft tissue lesions. tendons, cartilage, and muscles. Diagnostic arthroscopy is a surgical procedure which directly visualizes the lesions like damaged menisci or cartilage. The treatment of knee pain depends on the cause. Minor injuries can be managed at home with over the counter drugs and RICE therapy which stands for Rest, Ice, Compression and Elevation. The injured part should be protected as well [PRICE therapy]. This is a very effective treatment for mild sprains. Severe injuries need immediate medical attention. The dislocation needs immediate reduction and immobilization. Fractures need immediate splinting followed by definitive treatment which could be operative or nonoperative. Acute ligament injuries require immobilization followed by leg-strengthening exercises. Cruciate ligament injury may require surgical repair or reconstruction. Acute traumatic meniscal tear in a young patient would need surgical treatment whereas degenerative meniscal tear can be treated by exercises alone. Tendon ruptures would require surgical treatment either repair or reconstruction. Osteoarthritis is treated by NSAIDs, lifestyle modification, weight reduction, and exercises. Severley damaged joints may need a joint replacement. Rheumatoid arthritis requires treatment with disease-modifying drugs, NSAIDs and lifestyle modification. Replacement arthroplasty is considered for severely damaged knee joints. Gout and pseudogout treatments include control of inflammation with anti-inflammatory medications and drugs aiming at a reduction of crystal formation. Some conditions like acute trauma cannot be prevented. Risk factors for activity related injury are lack of proper warm up and sudden increase in training severity and duration. Therefore a proper warm-up would reduce the chances of injury. Obesity is a risk factor for osteoarthritis of the knee. Smoking is a risk factor for rheumatoid arthritis. Weight control reduces the forces placed on the knee during both athletics and everyday walking and may lessen the chance of wear and tear. Muscle strengthening, stretching and judicious exercises reduce the chance of injury during activities.